"The enchantress was so hard-hearted that she banished the poor girl to the wilderness, where she had to live in a miserable, wretched state." A case about a missing girl, Holly, gets reopened when a piece of her hair is found at a crime scene in the woods. All the plot points in this episode retell the story of Rapunzel. But this has a twist, Rapunzel is a Blutbad who hasn't had her hair cut in nine years. She lives out in the forest and killed someone with her hair to protect innocent hikers who had been taken hostage. Nick sees her when investigating the crime scene and has no choice but to turn to Monroe for his help. It was interesting to see Nick taken aback by the appearance of Holly. He usually isn't too bothered by the appearance of a Wesen but, as someone who is new to this Grimm world, the creatures shouldn't be second nature to him by now. There hasn't been enough time for that yet and it seemed like the producers realised that. Nick uses Monroe as a way to navigate this new world. He brings Monroe along as Holly as a Blutbad as well as Monroe and he hopes it will help to get Holly back. It works and Holly is no longer alone and afraid in the woods but they discover she has fallen seriously ill and they have to get her back to civilisation. But the problems escalate when friends of the drug dealer she killed turn up and Nick has to protect both Holly and Monroe from them. It is nice to see we are getting more from Monroe now and that he has evolved slightly from his Grimmopedia role he had in the earlier episodes. I have no problem with this except for the fact that he is coming across more as the main character than Nick. We get given lots of different opportunities to connect with his character here and lots of character traits and quirks, all of which are endearing. But there aren't many traits and quirks that has been given to Nick yet. The news that Nick is a Grimm is spreading. The handyman who ran out of Nick's house in terror has told his friends at a bar and of course, that never ends well. They also know where Nick lives. The way the creatures act around the subject of Grimm's shows that they are someone to be feared but Nick isn't like that. 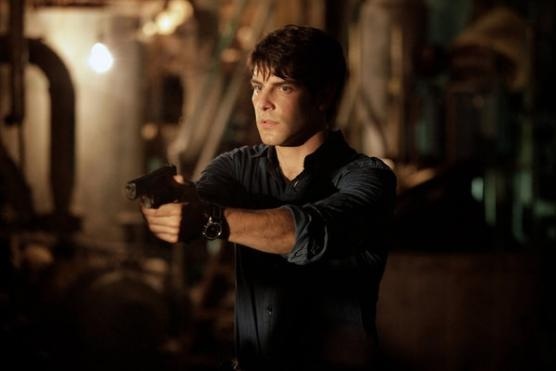 Nick is too compassionate to go around killing every Wesen he sees but I feel that that will put in conflict with any other Grimm's he may encounter. What this episode proves is that the topic of the supernatural can be blended with a softer touch. Holly was a Blutbad but she was a lost girl, she only managed to stay alive in the woods because of her wolf side but only managed to make the transition to the normal world because of Monroe. While the fairytale element was needed to tell the story it wasn't necessarily crucial and the emotional and scary parts of her ordeal are able to shine through in an ideal mixture!